Berend Tobia Boeyinga was born in 1886 in Noord-Scharwoude as the son of a reformed ('Gereformeerd') minister. Originally his name was spelled Boeijinga. After having worked as a carpenter he moved to Amsterdam in 1909 where he studied to become an architect. During this period he worked as an overseer for the offices of Eduard Cuypers, Charles Estourgie and Michel de Klerk. He graduated in 1919 with a design for a new parliamentary building. 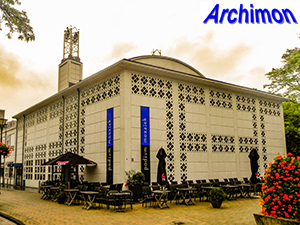 In 1921 he became an architect for the Amsterdam municipality; in this function he became involved in several large housing projects. This rather anonymous way of working didn't satisfy him, and after having participated in several competitions he left his function in 1926 to become an independent architect. 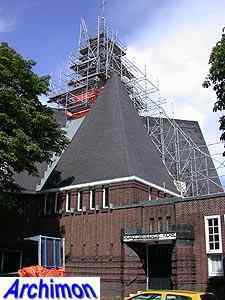 Although a versatile architect, Boeyinga is especially important for his churches in Expressionist style; he was one of only a few architects of the Amsterdam School who designed churches. In Boeyinga's case in first instance for the Gereformeerden for whom he built 15, plus three for the Hervormden. 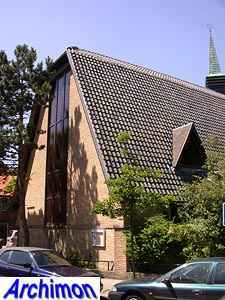 In 1926 a conflict within the church over the interpretation of the history of creation made him leave his denomination, after which he joined another one in 1930 which in 1946 merged with the Hervormden. Shortly before he died he returned to his old church. Boeyinga's religious architecture was greatly influenced by his faith. 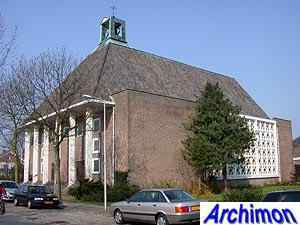 He was a great admiror of the leader of the Gereformeerden movement Abraham Kuyper and his ideas about art and architecture. 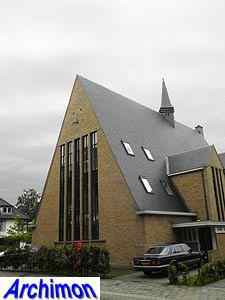 More than any other architect of this denomination has Boeyinga tried to design optimal centralized churches. After having designed in Expressionist style for many years in the late 1930's he experimented with other styles as well. After World War Two he restored several churches as well as building several new ones. The following list is an attempt at an overview of Boeyinga's work and is still incomplete. Corner house in Rationalist style. 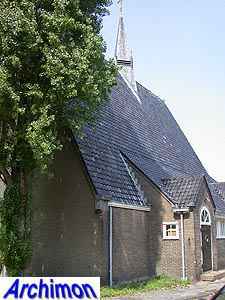 Boeyinga's first church. Church in moderate Expressionist style, with short tower at the front. Houses and shops in moderate Expressionist style. Centralized church in Expressionist style. Three 'naves' of different sizes are arranged fan-wise and meet at one point. Simplified version of a non-executed design from 1923 for a church in Amsterdam. Later renamed Koningkerk. Completely destroyed by fire in 2003. White-painted church in Expressionist style. Ground-plan is a Greek cross. 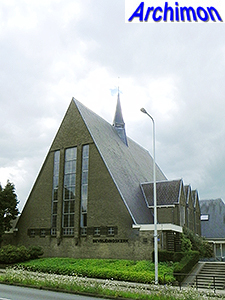 Boeyinga used an earlier non-executed design for the church in Zaandijk as the basis for this one. 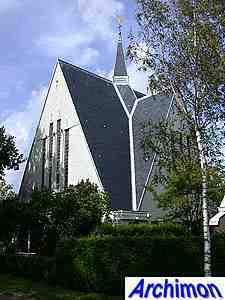 Church in Expressionist style, with fan-like ground-plan. 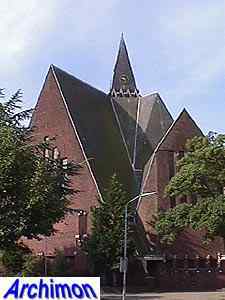 Church in Expressionist style, with fan-like ground-plan. Designed in cooperation with R.J. Hoogeveen. Building for psychiatric institution Vrederust. Design influenced by English mansions. 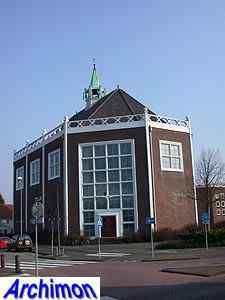 Laboratory-building for the university founded by the denomination of the Gereformeerden. 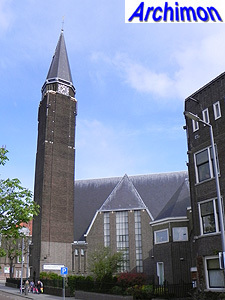 One of the last examples of Amsterdam School architecture. Church in moderate Expressionist style. Church in Expressionist style. Rebuilt into four houses in 2006. Small church in simple Expressionist style. 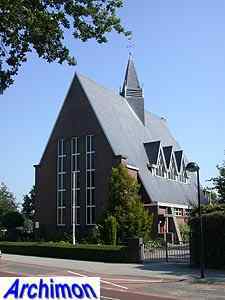 The last of Boeyinga's churches with a fan-shaped ground-plan, but the Expressionist style is changed for a moderate version of New Objectivity. Demolished. Church in Traditionalist style, inspired by early christian basilica's. Tall tower with saddleback-roof. Restoration of war-damaged Gothic church. Temporary church. Demolished ca. 1962. Modern church. Closed and rebuilt into a theatre. Aisleless church with polygonal endings. Inspired by a huegenot church in Calais, France. Designed in cooperation with A. Warnaar. Designed in cooperation with A. Warnaar. No further details. 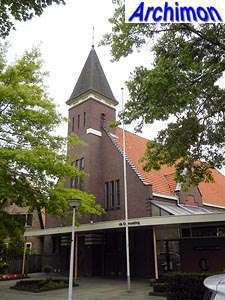 Aisleless church, designed in cooperation with A. Warnaar.